They thought that Skratch the Cat had missed the boat. But he surprised them all by bursting through the aft door. "Ask the question," he roared and he waved a paw. 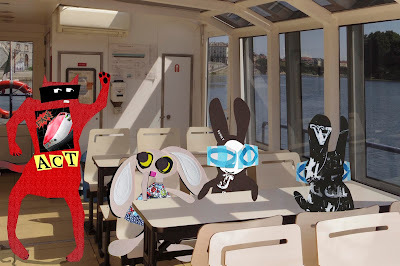 The Wabbit could see his reflection in the window and he laughed. "That's a self referential T-shirt!" "The T-shirt answers the adventure question for me," purred Skratch. "We were so trekking across the universe," said Wabsworth gravely. Lapinette nodded demurely. "A syntagmatic analysis would suggest a system of signs consistent with the Odyssey." "Such is the surface structure," replied Skratch dryly. "We weren't much on the surface," said Wabsworth. "Then it was about Quantum, our container," said the Wabbit, "and our Space Traveller sought after new containers." Wabsworth sighed. "He sought after me and I didn't like being a container." Lapinette was in academic mode. "Is not the Odyssey a system of containers?" Skratch was delighted. He purred furiously. "It's a bounded subsystem within a system of time and space." "But where are our drinks in time and space?" asked the Wabbit. "Unfortunately," said Skratch, "the bar is closed." "When do we disembark?" groaned Lapinette. Wabsworth cheered wildly. "In two minutes." "Is there a caffè?" queried the Wabbit. "There are four." smiled Wabsworth. "Then we have to check them out," said Lapinette. The Wabbits teeth flashed. "We'll recce one each and communicate by radio." Lapinette suddenly pointed. "Klingons on the starboard bow!"